If you’re not familiar with MS (multiple sclerosis), it’s a disease of the central nervous system that affects around 350,000 Americans, mostly Caucasians, and more often women than men. Its numbers are higher in populations where typical diets are composed of lots of beef, butter, cheese, and other saturated fats. MS is often treated with expensive and toxic drugs, but Dr. John McDougall (you may recognize him from the film Forks Over Knives) has successfully treated many MS patients with a plant-based diet, based upon the low-fat, whole foods diet pioneered by his mentor Dr. Roy Swank. I woke up on April 17, 1989 to one of the darkest, most life-altering days of my life. As I got out of bed I was shocked to find that my left leg collapsed under me. It felt heavy and would not support my weight. I erroneously passed it off as a pinched nerve. My doctor couldn’t find any cause for it, so it became a watch and wait situation. I dragged that leg around for more than six weeks. Finally, my family doctor scheduled an appointment with a neurologist in Phoenix, Arizona at a well-known neurological institute. My doctor warned me ahead of time that the physician he was referring me to did not have a pleasant bedside manner but that he was very proficient in his field. An MRI was performed and the follow-up meeting with the neurologist went something like this: The MRI shows that you have multiple sclerosis. You are among the top third of the worst cases we’ve ever seen here. You have a few good years left. The neurologist delivered the news with as much compassion and sensitivity as a weatherman might deliver the day’s highs and lows. Talk about devastating! 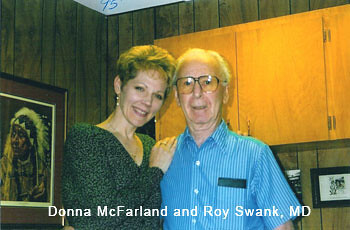 Fortunately, within a short amount of time, I discovered Dr. Roy Swank [Dr. McDougall’s mentor]. I learned that he had studied multiple sclerosis (MS) since 1946 and, based on his scientific findings, had successfully treated MS patients through a healthful diet. I studied his program intensely, adopted a very low saturated fat diet (15 grams max a day), and ate lots of clean, whole foods. I didn’t look at it as a diet but as a lifestyle, one that I enthusiastically embraced. It’s been eighteen years now since I first met with Dr. Swank, and today I do not use any kind of aids or devices (such as a walker, cane, or braces), but I do eat Dr. McDougall’s low-fat, plant-based diet, and I take the daily rest breaks that Dr. Swank strongly advised. I am grateful for each day of health that I enjoy, and only occasionally do I feel some extremity tingling (when I’ve allowed myself to overdo it without rest). To quote Hippocrates, the Father of Medicine, Let your food be your medicine and your medicine be your food. This is certainly the message in the work of Dr. Swank and Dr. McDougall. If you know anyone who suffers from MS, Dr. McDougall has a wonderful website with lots of information, and programs for getting started on a kind, low-fat, plant-based diet. You can also donate to Dr. McDougall’s ongoing research efforts here. Thank you for sharing your story Donna and thank you for all the kind work you do, Dr. McDougall! Do any of you kind lifers struggle with MS or know someone who does? Previous Postmark bridges wins BAFTA for the artist!